This week, Giza Inspectorate operated 18 water pump machines to pump out subterranean water that has accumulated under the Sphinx. The machines are distributed over the Giza plateau according to a map showing the areas where the subterranean water has accumulated. Mohamed Ibrahim Minister of State for Antiquities said that the machines will pump out 1100 cubic metres of water every hour, based on studies carried out previously by reputed Egyptian and American experts in subterranean water and ground mechanic and equilibrium factors. He explains that the reasons behind the increase subterranean water-rates is because of the new drainage system installed in the neighbouring area of Nazlet Al-Seman. Mohamed El-Sheikha, head of Projects Section at the Ministry of State for Antiquities (MSA) said that the project is carried out in collaboration with USAID (US Agency for International Development), which also supported similar projects at Karnak and Luxor temples in Luxor eight years ago. Pumping work will start in the area of King Khafre’s Valley Temple and the area surrounding the southern hill. El-Sheikha explains that according to ecological and geophysical studies, the Sphinx and its bedrock are safe. 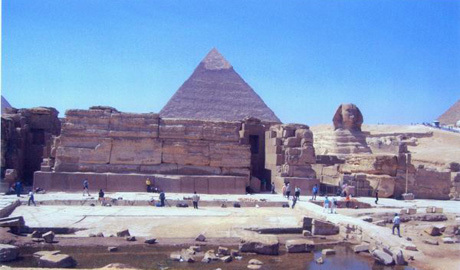 He told Ahram Online that the level of water under the ground level is 4.6 metres, similar to the level in ancient time. Such a level, El-Sheikha pointed out, is natural since one of the Nile branches had once reached the plateau when a harbour was dug to shelter boats transporting required blocks from quarries in Aswan and Tura in Helwan for the construction of the pyramids. when i went to Egypt in 93 the tomb of Saint George in old Cairo was submerge under water and no one was unable to see his tomb. When will they start picking up the trash around the Sphinx or the pyramids of Giza? Oh, sorry, silly question right? So when trash is no longer produced, we are back at the original question...When will the trash on the Giza Plateau be picked up? When will the Solar Boat Pits be cleaned of the garbage? I read an article and saw photos of a "Tomb of Osiris" of the Sais Period, which had been built beneath the Sphinx. There were photos of a coffin submerged in water in this cenotaphic tomb, and claims that the water was originating from this underground source. Is this true? Has the Osiris tomb been opened? Are the plans for excavating under the Sphinx in any form? Yes, the water comes from the nile river and from carsic aquiphers underground. And yes, the tomb is there and has been largely documented, very very deep.